Rackspace steps up to the plate with a new hybrid architectural solution. Earlier this year we talked about the “other” hybrid architecture; the one that lives out there, in the cloud, but that combines two different deployment models: applications deployed on co-located servers that are imbued with elasticity by taking advantage of the same provider’s cloud computing offering. Throughout the year I’ve posited (nearly harped upon) the reality that because most organizations are not greenfields, hybrid architectures will be the norm. This is especially true with applications that have consistent workloads and that may only benefit periodically from the elasticity enabled by cloud computing. Some organizations prefer the benefits of a hosted environment for applications, but only need to take advantage of elasticity once in a while or, perhaps, they need that elasticity as part of a longer time strategy to manage potential growth and scale. Such an architecture, as proven out by Terremark, is not on possible but realistic, and the excellent folks at Rackspace recently posted a more detailed description of such an architecture. 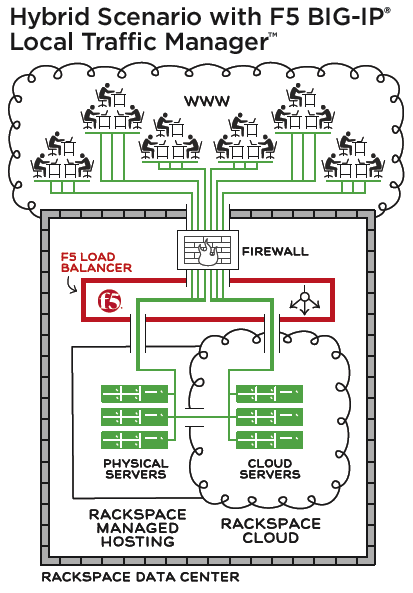 This is an F5 Friday post, so if you’re wondering where F5 fits in the picture, well, Rackspace’s solution leverages BIG-IP in their hybrid architecture to provide the dynamism required for hosted applications to take advantage of its cloud computing resources seamlessly. 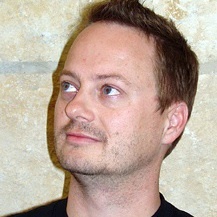 This post comes to you from Toby Owen, Rackspace Product Manager for Hybrid Hosting Solutions. As discussed in a previous post, Rackspace offers a suite of computing services, from Managed Dedicated Servers, to Private Cloud, to the Rackspace Public Cloud. Many of our Managed Dedicated hosting customers utilize cloud services for various tasks. In today’s post, I’d like to discuss how you can utilize both dedicated and cloud platforms at Rackspace in a more integrated fashion. Servers for some of those apps and Cloud Servers for others. Keeping some applications separated can allow you to test new applications without affecting your production environment. Other applications can benefit from using the Cloud and Dedicated environments in a connected way. With Cloud Connect, you have the option to connect these platforms to build a scalable, flexible compute solution that offers the performance of dedicated servers with the flexibility and scalability of the Cloud. Toby goes on to provide several use cases for this hybrid architecture including the traditional “dev and test” environments, seasonal traffic spikes, and an intriguing PCI compliant solution that leverages its dedicated server offering for PCI specific application workloads in conjunction with “cloud servers” for the more variable load web application portions of such solutions. It’s one solution to the “cloud security” issue that is often raised in conjunction with PCI DSS. Not mentioned as a scenario, but one that is certainly possible in a combined dedicated + cloud computing architecture is the ability to leverage Rackspace “cloud servers” to augment capacity for applications hosted on its dedicated (physical) servers until it becomes clear that the capacity increase is permanent. Such an architecture allows for immediate response to increases in demand but as a temporary stop-gap solution while budget is freed or trends are collected and the allocation of new dedicated resources to scale can be accomplished. Hybrid architectures are going to be the norm for all but the most aggressive organizations. With the exception of startups, who are lucky enough to have a green field in which to build their data center architectures, organizations will continue to have and support a variety of technological solutions that must be integrated and managed together. Whether that’s legacy mainframe applications and client-server combined with Web 2.0 and SaaS or some other combination thereof, there will be applications that for some reason either cannot be deployed or will not benefit long-term from being deployed on cloud computing environments. Whether that hybrid architecture comprises local data center and public cloud computing or a hosted/managed data center and public cloud computing is not as important as the resulting architecture, which is after all, a hybrid. This kind of flexibility will better support organizations moving forward, as it is a rare organization that does not have a variety of computing needs that must met and that cannot be met with one deployment model. A hybrid, dedicated-cloud architecture provides another option for organizations to better meet their computing and operational needs.